Ultrabooks, tablets, all-in-one PCs ... these are still selling, right? Right? 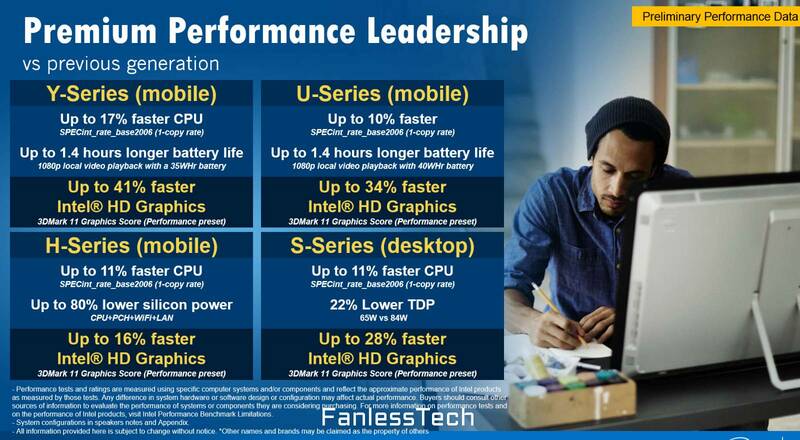 And it appears Intel is testing that definition – if these internal Intel Powerpoint slides that made their way to a blog called FanlessTech this month are the real thing. The slides suggest that Intel is still plugging away at producing more processors for tablets and Ultrabooks, even though these products aren't selling particularly well. Specifically, the deck shows off the performance numbers of Intel's Skylake chips, which are 14nm processors that are due to arrive in the autumn. It's rumored the processors, which will use the new Skylake microarchitecture, will be unveiled as early as August 5. As one should expect, the slides boast that the Skylake design whips its predecessor, the 14nm Broadwell family that uses the Haswell microarchitecture. To put these codenames into context, the Broadwell-Y series is a 4.5W system-on-chip (SoC) better known as the Core M, and is aimed at tablets and low-end Ultrabooks; the Broadwell-U series is better known as the 15W and 28W Pentium, Celeron and Core i3, i5 and i7 parts, and are aimed at Ultrabooks and NUCs; and the Broadwell-H series is better known as the 37W and 47W Core i5 and i7 parts, and are aimed at all-in-one systems. In other words, Broadwell targeted, among other things, tablets and Ultrabooks. But with tablets, two-in-one typoslabs, Ultrabooks, and the rest of the PC market waning, and Intel struggling to get more than a token market share in tablets, has Chipzilla given up on these devices? No, it appears not. 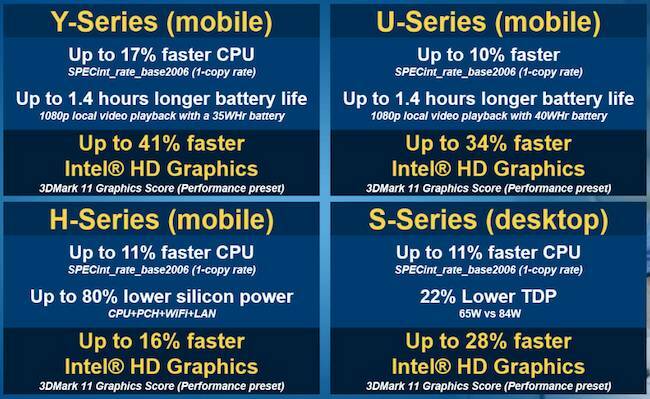 Intel's taking another crack at them with Skylake, if the leaked slide below is correct. Intel is going to, more or less, try the same thing again and expect different results, which some may say is clear-cut insanity. Mobile-friendly Skylake-Y: Up to 17 per cent faster than Broadwell-Y, up to 1.4 hours more battery life, and up to 41 per cent faster graphics performance. Mobile-friendly Skylake-U: Up to 10 per cent faster than Broadwell-U, up to 1.4 hours more battery life, and up to 34 per cent faster graphics performance. Mobile-friendly Skylake-H: Up to 11 per cent faster than Broadwell-H, up to 80 per cent lower power consumption, and up to 16 per cent faster graphics performance. By mobile, Intel means tablets and notebooks. We're not quite sure what the Skylake-S is supposed to compare to. Intel refused to comment on the slides. The deck is labeled "preliminary performance data," so your mileage may vary. The graphics boost is supposed to come from Skylake's next-generation Intel GPU that delivers 50 per cent "better" 3D gaming. Also, according to the slides, there's particular attention on other mobile-friendly things, like support for up to four HD cameras and the latest memory card protocols, improved touch and stylus sensing, and support for A4WP wireless charging, and Bluetooth 4.1.